Get set Darwin as One Tropical Day returns with another musical feast for your senses, if it has been a while since you danced up a storm, sang out loud, smiled your face off or had a night out with your friends or lover…the time has come. 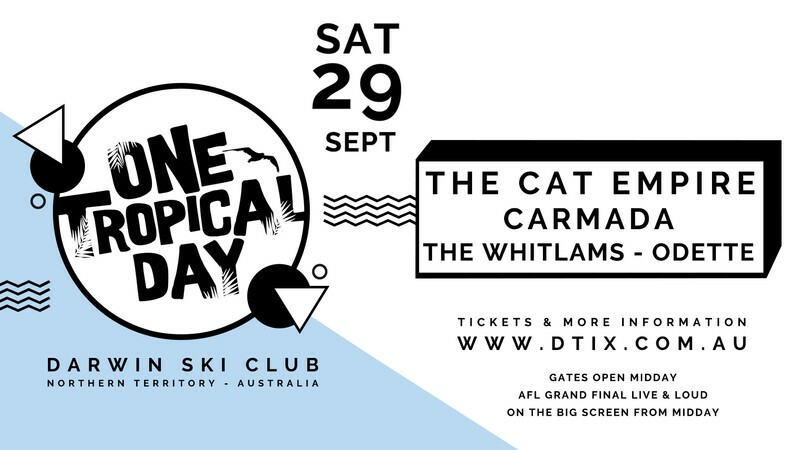 Join us at the Darwin Ski Club as the purveyors of good times, The Cat Empire, lead the charge of a world class all Aussie line up. Known far and wide as one of the world’s greatest party bands. Their colourful, genre-bending music, shipped across the globe in traveller’s backpacks, seems at home almost anywhere. Difficult to describe and impossible to categorise, The Cat Empire’s reputation is built upon a chaotic and fiercely uplifting live show with songs that make people dance, and music that makes you feel like you have just been swept up in a big, colourful, cacophonous parade. What happens when two great forces of inimitable talent collide and morph into one? Carmada, of course. Upon finishing their 2014 Splendour In The Grass show in front of a 10k crowd, LDRU and Yahtzel, two of Australia's most talked about young producers, decided to go beyond their B2B set and previous collaborative efforts by merging their mad production skills and sheer talent to officially form Carmada. The pair locked themselves away in the studio for the first time after their joint single "The Only One" dropped on Future Classic in March 2014, to create their groundbreaking first EP "Realise"—a release so hot that it hit #1 on the Australian iTunes Album Charts. When they hit the stage at the Darwin Ski Club you’ll understand why everyone from Skrillex to Triple J are screaming their name. Renown for their classic hits including ‘Blow Up the Pokies’, ‘No Aphrodisiac’, ‘Thank You (For Loving Me At My Worst)’ and many more. The group's single, "No Aphrodisiac" was listed at number one on the Triple J Hottest 100, 1997. The Whitlams have commemorated a quarter of a century as a multi-Platinum-selling, ARIA Award-winning band. According to frontman Tim Freedman, the show will do a deep dive into the band's seven-album oeuvre, busting out not only their well-travelled favourites but also some rarer cuts. One of Australia’s most promising talents only newly unearthed by Triple J. Odette comes across wise beyond her years. Born in England, she was raised in Western Sydney, and grew up with an eclectic musical palette. Her South African Mother introduced her to African music, Soul, Funk and Rhythm, whilst her English Father hailing from a long line of Jazz pianists introduced her to new wave and Jazz. With that heritage and talent passed on to her from her parents it’s only right that Odette has played piano since she was a child and her unique vocal and lyrical style is embraced by so many already. Don’t miss this eclectic mix of some of the hottest talent to hit Darwin this year! For tickets and more information, visit the DTIX link.